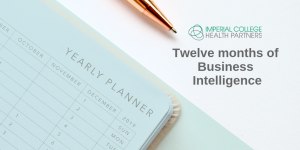 Andi Orlowski, ICHP’s Deputy Director of Business Intelligence, reflects on the developments and impact that the Business Intelligence (BI) team have had for Imperial College Health Partners (ICHP) over the last twelve months. The aim of ICHP is to innovate and collaborate for a healthier population; as the BI team for ICHP we are continually building and using our expertise to enable and empower this goal. Over the last twelve months we have been steadily increasing impact through providing practical analysis, statistics, health economics and scenario modelling to support our partners in making the best possible decisions. We are proudly leading the way on setting the population health agenda; freely sharing our knowledge and helping our partners to truly understand their local communities, seen through our work on Joint Strategic Needs Assessment (JSNAs). We have travelled across the UK accepting invites to share our expertise and code to a wide host of audiences from Nottingham Integrated Care System, to the team at the South West Public Health Observatory (SWINPHO), presented at the Association of Professional Healthcare Analysts Conference, the Local Government Conference and at the Population Health Intelligence Collaboration. This has demonstrated our belief that to achieve healthier populations the key is in knowing exactly where alignment or variation lies to enable system leaders to better understand what specific population needs are driving their health economies. A significant high for the ICHP as a whole has been being nationally recognised as key in helping the development of new, integrated health care systems through being successfully awarded a place on the Health Systems Support Framework. It has been brilliant to work with our integrated care team and build our partnership offers. I’m immensely proud of how we have continued to demonstrate the fundamental need for robust evaluations to increase the positive impact of innovations. This year shown with our independent evaluation of behaviour change programmes for patients with Type 2 Diabetes. This work, with our NW London partners and welcomed by Diabetes UK, demonstrated the power of smart phones positively impacting patient outcomes. Our evaluation has meant that patients in north west London will now be offered more options in treatments improving their experiences. This year we have been demonstrating our strength in presenting data in a way that’s easy to interpret and makes sense to the client. Bespoke visualisations inform planning, decision-making and ultimately aids in socialising of data to be understood by a variety of audiences. Shown first hand, for example, with our AF Opportunity Analysis tool which allows CCGs to view, reflect and work with their data to support AF Strategy in NW London. Working in the public sector I’m passionate about freely sharing our work for our partners to understand what happens behind the scenes, being transparent in all that we do for the health of our local populations. For example, being able to share our insight into how we aggregated the data in our AF Budget Model has allowed other organisations to use our ICHP modelling for their work and ultimately improve options for patient populations. During the year we have been globally recognised as industry-leaders on using real-world NHS data sets and applying population health techniques to better inform health system improvements; seen through our selection to attend and present at various ISPOR (International Society for Pharmacoeconomics and Outcomes Research) conferences. I’m particularly proud of our research evaluating UroLift, a new type of prostate surgery for men suffering with benign prostatic hyperplasia. It won Best General Poster Presentation at the ISPOR Baltimore, and hit the headlines on BBC London News and a host of other media outlets, highlighting the £27 million a year cost savings that the NHS could make from its introduction. Our ethos of working in collaboration has resulted this year in ground breaking achievements in understanding hospital admissions coded with Suspicion of Sepsis (SOS). Only through our cross-system collaboration with the Patient Safety Collaborative (PSC), NHS Improvement’s Patient Safety Measurement Unit (PSMU) and NHS England were we able to create the SOS Dashboard. It was a fantastic achievement for it to have even been nominated for Enhancing Care by Sharing Data and Information category at the HSJ awards. This dashboard has gone from strength to strength with us delivering workshops, talks and webinars across country drawing on the power of our networks to help the spread and adoption. Partnerships like these are critical for future key conversations and vital in what we do. We ended 2018 on high with an invitation to the All Party Parliamentary Group (APPG) on rare, genetic and undiagnosed conditions. The event, attended by around 50-70 people including MPs and patient groups, looked at issues around the time taken for rare diseases to be diagnosed as well as the process that researchers and manufacturers have to go through to get new medicines for rare diseases licensed for use in the NHS. Our research gave those at the hearing a new insight into the cost and resource impact that the lengthy process of diagnosing rare diseases is having on the NHS – this is only possible through having access to powerful data sets. We’re looking forward to continuing to showcase our passion for data analytics and the crucial role it has in helping leaders to understand the health needs of their population and the important sub-populations within it. Also, crucially continuing to identify opportunities within data to improve the quality, efficiency, and equity of the care that is being delivered. Finally, supporting feedback loops that help leaders of the organisation to understand the impact and refine interventions they have put in place on the back of these insights. 2019 is set to be another busy exciting year!